Ignite your child’s imagination and curiosity at The Jones-Gordon School where exciting summer experiences await! We offer thematic, innovative, and engaging adventures that enable each camper to develop socially, emotionally and intellectually. 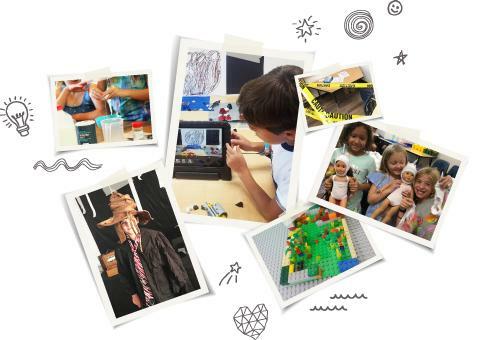 Favorites include Harry Potter Wizard Camp, LEGO Stop-Motion Animation, Cooking Camp and more! Download a 2019 JGS summer camp flyer! Hours: Mon – Fri, 9 am – 3 pm. Fees: $325 per camper, per week, except School’s Out and Adventure Sports camps, which are $350. 10% Early Bird discount applies if registration is completed by March 1, 2019. Invoices are sent via email as registrations are received. Payment in full is due within 5 days of emailed invoice date. Registration deadline for all camps is May 1 (or until full). Refunds CANNOT be given after May 1 (unless a camp is canceled by JGS due to low enrollment). NO refunds OR credits can be given for missed days, late arrivals, or early departures. Aftercare is available daily until 5 pm at $10/day ($15 drop-in) with a $25 late fee (applicable after a 5 minute grace period). No early care is available. On-site Water Play Day occurs every Friday, and includes visits from the Kona Ice truck and shave ice for all campers. Friday Pizza lunches are available for $7.